Folsom Lake was created in 1955 by Folsom Dam, a concrete dam flanked by earth wing dams and dikes with a total length of about 9 miles. The lake features some 10,000 surface acres of water when full and has 75 miles of shoreline. It extends about 15 miles up the north fork, and about 10 1/2 miles up the south fork of the American River. The Lake level normally varies from 466 feet elevation in early summer to a low of 426 feet in early winter. During a 24-hour period, the releases of water from Folsom Dam can vary greatly to meet changing demands for water and power. Nimbus Dam, seven miles down stream from Folsom Dam, stores these releases and re-regulates them to a steady flow downstream in the American River. Nimbus is a straight concrete gravity structure, 87 feet high and 1,093 feet long. Lake Natoma, formed by the waters held by Nimbus Dam is an afterbay or regulating reservoir for Folsom Dam. Two 6,750 kilowatt generators produce power from Nimbus Dam water releases. Nimbus also serves as a diversion dam to direct water into Folsom South Canal. The Folsom Project on the American River in California is a unit of the Central Valley Project (CVP). The CVP network includes dams, reservoirs, canals, powerplants and pumping plants. The project extends 500 miles southward from the Cascade Mountains and stretches 100 miles from the foothills of the Sierra to the coastal mountain ranges. 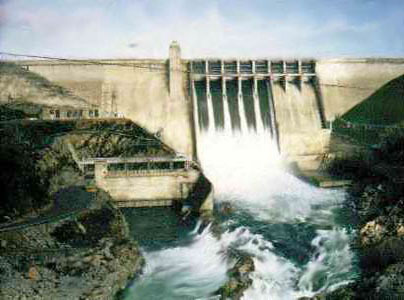 Folsom Dam is located about 23 miles northeast of Sacramento. The multipurpose project was built by the US Army Corps of Engineers and is operated by the Bureau of Reclamation. Although its primary function is flood control, Folsom stores water for irrigation and domestic use and for electrical power generation. Preservation of the American river fishery, downstream control of salt water intrusion in the Sacramento-San Joaquin Delta and water-related recreation are also important activities. The main dam consists of a 340-foot high concrete center section flanked by long earthen wing dams extending to high ground at either end. This along with other project features, holds over a million acre-feet of water in Folsom Lake. Directly below the dam is the Folsom Powerplant. Its three generators produce 198,207 kilowatts of power. Each year Folsom Dam prevents potential flooding downstream from winter storms and spring snow runoff. In 1955, during the construction phase and in 1964 and 1986, Folsom Dam saved the Sacramento area from major flooding when torrential rain and heavy snows fell in the Sierra Nevada/American River Basin. During the December 1964 storm, the inflow into Folsom Lake reached a record high of 280,000 cubic feet per second, with a river release of 115,000 cubic feet per second. That was 15,000 cubic feed per second over the downriver levee design capacity. Up to February 1986, the estimated flood savings totaled $438 million. In February 1986, Folsom Dam prevented an estimated $4.7 billion in flood damages.